If at first it was difficult, after a few weeks, it was easy and I have not missed not eating those chips, potatoes or other starch. In fact, even if I am starving at times, and potato chips or other ” not so good snacks” are around the house, they do not tempt me. I rather snack on nuts, fruits or protein bars. The problem is my sweet tooth. I like to snack on sweet things. 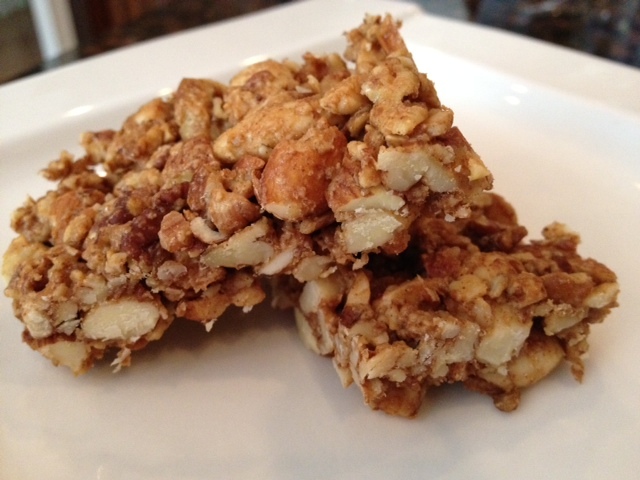 Proteins bars have been a great substitute to candy bars. The problem with them is that you have to watch careful for the ingredients as most protein bars contain carbs, and sugars and they are high calorific. They are also very expensive and can taste so unnatural. This weekend as I could not find a protein bars around the house, and did not feel like running to the store, I decided that I could make my own nut bar. How hard could it be???? After perusing several recipes, and not having any ingredients that they were calling for ( rice syrup, dates, ) I decided to do the following: bind the nuts with almond butter and maple syrup ( what I had on hand). 2 cup of raw blanched almond. 2 tbsp of vanilla extract. Place the nuts on the flexipan that you would have previously placed on a perforated sheet . Cook them for 10 minutes at 375 to roast them. Stir the nuts a few times during cooking so that all nuts will be roasted on all sides. When they are roasted and you can start smelling that nutty aroma coming out of your oven, remove the flexipan from the oven and place the nuts in a food processor to break them. They should be broken in pieces but not milled. Then in a small saucepan, add the maple sugar, the almond butter and the turbinado brown sugar and bring to boil. Add this mixture to the nuts and stir to coat the nuts. 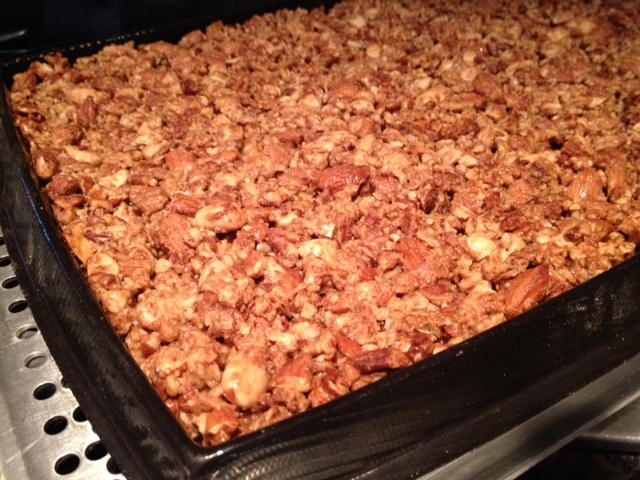 Empty this content back into the flexipan and with a spatula, press hard to make the mixture an even flat bar. Place the flexipan back into the oven and cook for another 10 minutes at 375. Et voila!!! 8. When the cooking time is up, remove the flexipan from the oven and let it cool. 9. 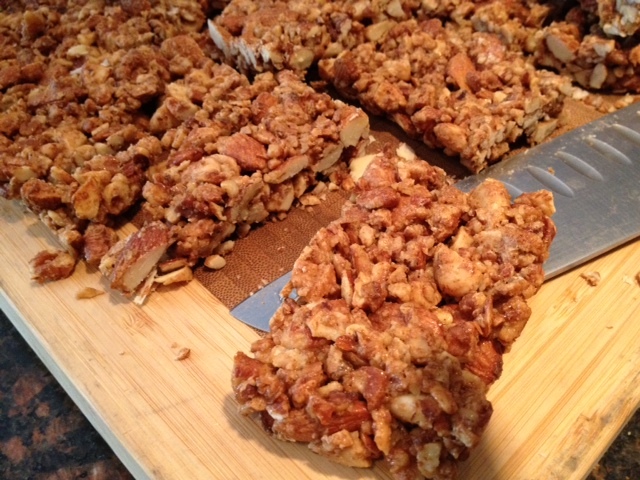 When the nut bars is completely cool, peel the flexipan off the nut bar, and with a sharp knife cut 2x 1 inches nut bar. 10. Place those bars either in a ziploc bar or in an airtight container so that the bars will remain dry.